The number of great indie books out there is astounding – beyond what I think most people truly understand. I’ve been in this business long enough to have learned that the legacy publishers don’t always pick the greats, which leaves more for the discerning public. Every author that I have added to my “lifetime favorites” list in the past 2 years has been an indie author. The general public, they don’t quite get this yet. I think that when indie “packaging” meets a professional standard, that begins to change. The packaging for a book comes down to just two things. The cover and the blurb. One or the other is the *only* thing you have to grab reader’s attention. They’ve both got to be well crafted and professionally honed or you *will* lose potential readers. tool for marketing falls flat on its face. A book release is like its red carpet debut. What do you want it to be wearing? Would you remember a celebrity walking down the red carpet in an off-the-rack or homemade gown. Those celebrities want to be remembered for what they are wearing and how they are styled in a positive way. They take a long time planning, and spend a fortune on the way they “package” themselves for an event. They understand the marketing opportunity of their attire and they grab it and run with it. Book covers should be considered in the same light. 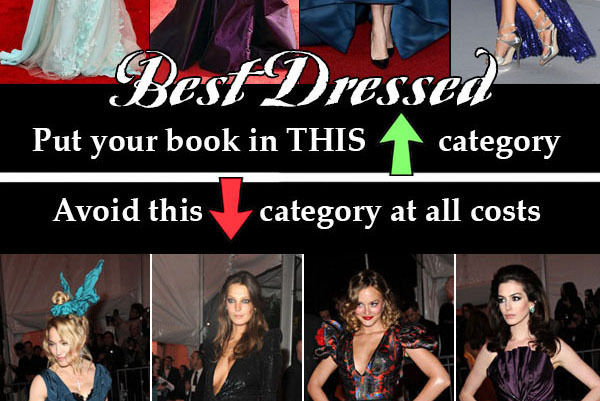 Possibly given even more consideration, since a book usually gets only one red carpet gown. So pay attention to what you’re dressing your books in. They’ve taken months, years, and sometimes decades to produce. Give them the packaging they deserve. Plan ahead, hire someone who knows what it takes to make a book speak for itself. Without the right cover and the right blurb, a book might walk right by the spectators and go completely unnoticed and unrecognized as the masterpiece it is.